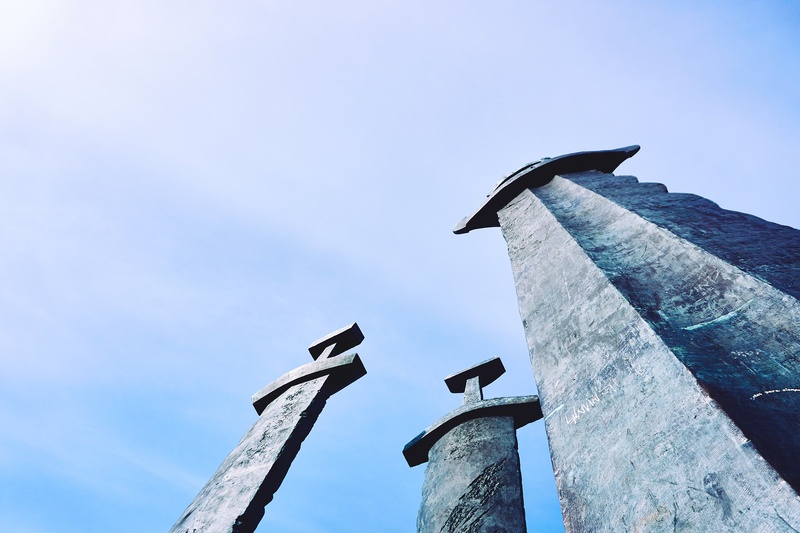 ‘The Swords in Rock’ (known in Norwegian as ‘Sverd i fjell’) is an architectural complex situated in the Møllebukta bay, Hafrsfjord, from the Madla borough of the city of Stavanger, Rogaland county, south-western Norway. It was designed by Norwegian sculptor Fritz Røed in order to symbolise the unification of Norway, and was unveiled by King Olav V of Norway in the year 1983. The monument consists of three swords that are made of bronze. They stand 33 feet (or 10 meters) tall, being planted on a small rock from the hill next to the fjord. They were built so as to celebrate the unification of Norway, which was made by King Harald Fairhair (Norwegian: Harald Hårfagre) after he had won the naval Battle of Hafrsfjord, likely sometime during the late part of the 9th century (although most contemporary scholars tend to claim that the process of unification was to a considerable extent lengthier, being the result of several centuries rather than of a single battle). The precise date of the battle is disputed among scholars, but is has been often indicated as 872 (according to the 19th century works of Norwegian historians Rudolf Keyser and Peter Andreas Munch) and formalized as such in 1872, when this year was chosen in order to celebrate the millenary anniversary of the unification of the Kingdom of Norway. Whatever the exact year of the battle might be, the aftermath was clear: opposition on behalf of the Viking Age chieftains from Rogaland and Sognefjord areas was crushed at the hands of the victorious King Harald Fairhair, thus paving the road for Norway’s unification under a single crown. The largest of all three swords — which also features a crown on the top of the handle — is ascribed to King Harald Fairhair, whereas the two smaller ones designate the defeated petty kings.